Networks are goldmines of data, but finding those nuggets of useful data on issues that are directly impacting the customer experience — in real time — is moving further and further beyond human capacity. Network and traffic volumes continue to grow and service providers are looking for the next generation of performance management analytics tools that can handle petabytes of data to proactively detect and prevent issues that impact service performance. A mobile network easily generates billions of performance data points per day. It may well be high quality and valuable performance visibility data, but it’s too much data for network teams to analyze. Finding insights in the data and solving performance issues often requires engineers spending time poring over Excel pivot tables for weeks at a time and getting lucky if they notice something meaningful. How can service providers turn billions of performance data points into insight that can make their network better? Cloud computing power, analytics and machine learning software can do the grunt work when it comes to baselining performance, detecting patterns and anomalies, and proactively alerting and guiding on how and where to resolve service issues. Fixes that previously took days (usually more like weeks) can now be completed in minutes. Generating reports and visualizing issues is also easier and faster with machine learning and advanced analytics behind the curtain. Reports with comprehensive performance insights can also be shared easily with other teams and customers. Driven by the move to dynamic software-defined and cloud-native networks, service providers are looking to these analytics and machine learning technologies to turn the billions of data points into meaningful service performance ‘insights’. For software-defined services provisioned on demand, this insight has to happen in real time. Granular active test data needs to be analyzed with analytics and machine learning to understand the current state of service performance, as well as sending events to orchestrators for self-healing in a closed loop. 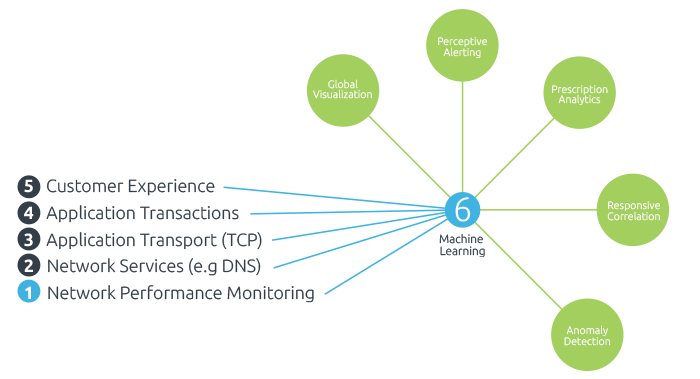 Analytics and machine learning can also be used to identify ways to improve network and service performance, proactively identifying recurring problems, and predicting where issues are likely to occur. This allows a shift in focus from reacting to network issues to predicting what could happen and taking proactive action to avoid customer impact. SkyLIGHT DataHUB IQ is built from the ground up, using the best cloud, open source and machine learning software, to handle the growing volumes of network traffic and uncover at speed ‘the invisible’ issues that are causing service degradation. DataHUB IQ combines the power in these performance KPIs with other network data to provide deep insight into network behavior and the service experience of customers.